Dec 28, 2017 • Researchers from Sydney, Australia, and Bogor, Indonesia demonstrate that tropical peatland can be mapped accurately using freely-available remote sensing data and open source software. At COP23 in Bonn, the Global Peatlands Initiative holds events aiming to bring peatlands on the agenda at COP23. Peatlands have an important role in the global carbon cycle as it stores a huge amount of carbon. A small loss of peat from land clearance and mismanagement can contribute a large amount of CO2 to the atmosphere. Indonesia has one of the largest peatlands in the tropics, with an estimate of 15 million hectares. 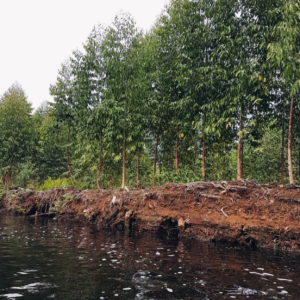 Responding to the global issue of reducing CO2 emissions, Indonesia has legislation on the protection and management of the peat ecosystem. The legislation outlined conservation areas, which depends on the thickness of peat; however, the main challenge is the lack of fine-scale, accurate maps of peat distribution and its thickness. The current peatland map in Indonesia is at a coarse scale with much uncertainty that it cannot be used to implement conservation and management regulations. Traditional soil mapping techniques are too costly as they require many field observations, and the outputs can be too subjective. Many technologies for mapping peatlands have been tested in Indonesia, including flying sensors to detect peat from the above. However, many of the technologies are not cost-effective for large extent mapping. Researchers from the University of Sydney, Australia and Institut Pertanian Bogor in Indonesia proposed an open digital mapping methodology, making use of open data in an open-source environment, as a cost-effective and accurate method for mapping peat and its carbon stock for large areas in Indonesia. The study was published in Geoderma, a global soil science journal. This open methodology combines field observations with factors that are known to influence peat depth distribution in space. These factors are represented by multi-source remotely sensed data derived from freely-available open data: digital elevation model from the Shuttle Radar Topography Mission, geographical information, radar (ALOS PALSAR and Sentinel 1 data) and optical images (Landsat). The method makes use of advanced machine learning models to predict peat depth every 30 m on the land surface. To make it transparent, accountable, and repeatable, all mapping procedures were scripted in the R open source and free software. The authors successfully applied this approach in mapping peat thickness and carbon stock in the Bengkalis Island, Sumatra, covering an area of 50,000 ha. The authors further provided an estimate of the cost and time required for map production, i.e. 2 to 4 months with a cost between $0.3 and $0.5/ha for an area of 50,000 ha. Obviously, there is a tradeoff between cost and accuracy. Researchers from Sydney have developed digital soil mapping techniques and successfully applied them for nation-wide soil carbon mapping in various countries. Some researchers believe that the only solution for peat mapping is to fly Lidar, a laser instrument which measures the topography of ground surface. This study demonstrates that we can map peat thickness accurately using freely-available data, the key is that we need to use multiple source of information not just elevation. Due to the open nature of the method (open data, and open-source), the method is scalable to the whole country and can be done in parallel by many groups. With appropriate training, various groups in Indonesia can perform this mapping procedure in a standard, and objective way. The authors envisage if done in parallel (both field work and computer modelling), utilising existing observations and collecting new observations, a high-resolution peat map (estimate of peat thickness every 30 m) for Indonesia can be completed within 2 years.